Avid readers will know that I only suggested the use of a blowtorch as an alternative to the oven for my baked Alaska recipe yesterday. The preference for baking meringue is always the oven over the blowtorch. So it seems is the view of Bake Off judge Mary Berry. I didn't see Wednesday night's Great British Bake Off but press reports yesterday suggest Mary blasted nearly every Bake Off star for 'loving' the blowtorch. In Mary's day, the blowtorch was used for metalwork and not home economics. But her view today is that a meringue topping is best put in the oven to get a crunchiness. I couldn't agree more, Mary! Last year Mary Berry sparked a controversy on the Bake Off when she banned the show's bakers from using 'these fancy blowtorches' to make creme brulees, saying that not everyone has one at home. Her instructions were criticised at the time by chefs, with many pointing out that blowtorches are widely used for restaurant creme brulees. They might be, but do you have a blowtorch in your kitchen? I doubt it! And this only convinces me more and more, that the Great British Bake Off is simply an 'entertainment' show, and not a programme that stimulates more of us to bake! I applaud Miss Berry's traditional approach to meringues and top chef Jean-Christophe Novell, a French celebrity cook, was not surprised that Mary had been disappointed. 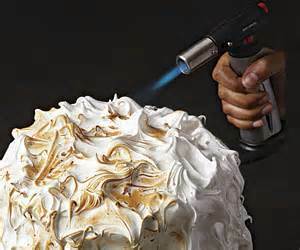 He is reported to have said that it may be trendy to use a blowtorch, but the art of a classic meringue is respecting the classic technique which is the oven. The blowtorch is too intense and too direct, but I suppose the Bake Off novices are trying to follow the fashion of the restaurant chefs. So, if you want the best baked Alaska this weekend, use the oven and not the blowtorch!